← Battle of the TV Cowboys: Hoppy vs. Cisco! On to the third match in our Rumble in the Stacks! This bout is between two actual historical figures, Buffalo Bill and the (in)famous Tom Horn–who do you think would win in a fight? Buffalo Bill Collection, #264, Box 4. UW American Heritage Center. 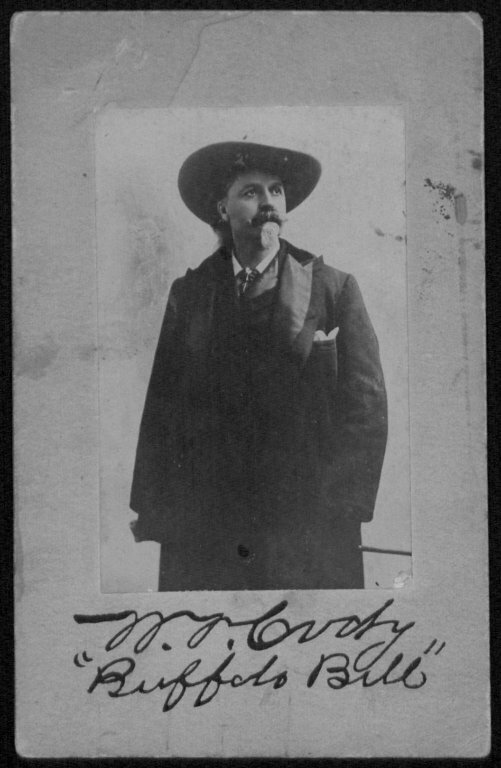 Claim to Fame: Buffalo Bill Cody, the man behind the “Buffalo Bill Wild West” show was essential to the establishment and development of the city of Cody, WY. He was instrumental in securing water rights from the Shoshone River for Cody, WY and the surrounding area. The Shoshone Dam was later renamed the Buffalo Bill Dam in his honor. Collection Connection: The AHC holds the “Buffalo Bill Letters to George T. Beck,” a collection that contains a detailed account of Cody’s efforts to establish the irrigation canal on the Shoshone River, as well as the Buffalo Bill collection, which contains materials on the Buffalo Bill Wild West Show. 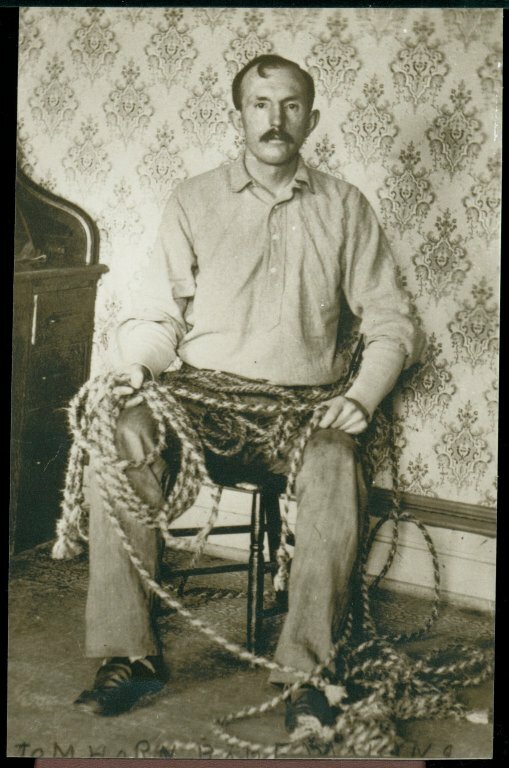 Tom Horn tying lariats. Photofile: “Horn, Tom,” Negative Number 1267. Tom Horn, UW American Heritage Center. Claim to Fame: Military scout and interpreter, deputy sheriff, Pinkerton detective, hired gun. Arrested for the murder of 14-year-old Willie Nickell and hung in 1903 after a trial and appeal. Collection Connection: The AHC holds the Joe Le Fors papers (Le Fors was the man who captured Tom Horn), and there are project files on Tom Horn research from the Wyoming Council for the Humanities records at the AHC, too. In addition, the George Banks papers contain a statement by George Banks that he overheard talk of a murder planned by Tom Horn—and these are just a few collections! This entry was posted in American Archives Month, Western history, Wyoming history. Bookmark the permalink. Tom Horn would win just becouse he lived and fought the apache wars and was againest the small ranchers of Wyoming (worked for the stockgrowers). Wild Bill only has one fight with the Indians ( Yellow Hand ). Buffalo Bill, and he’d make a bundle on the tickets to the fight!